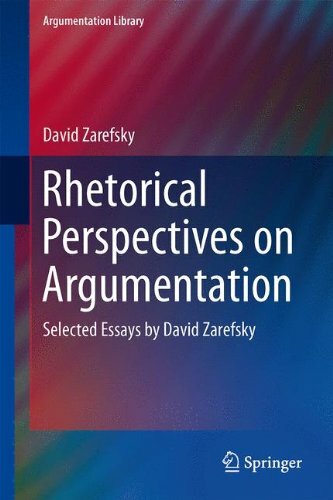 This book contains 20 essays tracing the work of David Zarefsky, a leading North American scholar of argumentation from a rhetorical perspective. The essays cohere around 4 general themes: objectives for studying argumentation rhetorically, approaches to rhetorical study of argumentation, patterns and schemes of rhetorical argumentation, and case studies illustrating the potential of studying argumentation rhetorically. These articles are drawn from across Zarefsky’s 45-year career. Many of these articles originally appeared in publications that are difficult to access today, and this collection brings the reader up to date on the topic. Zarefsky’s scholarship focuses on the role of language in political argumentation, the ways in which argumentation creates public knowledge and belief, the influence of framing and context on what is said and understood, the deployment of particular patterns and schemes of argumentation in public reasoning, and the influence of debate on politics and governance. All these topics are addressed in this book. Each of the conceptual essays includes brief application to specific cases, and five extended case studies are also presented in this volume. The case studies cover different themes: two explore famous political debates, the third focuses on presidential rhetoric across the course of United States history, the fourth on the arguments for liberalism at a time of political polarization, and the fifth on the contemporary effort to engage the United States with the Muslim world. This book is of interest to scholars in the fields of philosophy, logic, law, philosophy of law, and legal history. The range of topics and concepts addressed, the interplay of concepts and cases and the unifying perspective of rhetorical argumentation make this book a valuable read for students of argumentative practice, whether rhetorically or otherwise.